Lilla embarked on her successful career as a full-time illustrator in 1984 with clients ranging from The New York Times, Takishamaya, Barneys New York, and Levi’s. She had agents in Tokyo, Paris, and New York. She also taught illustration classes in her studio, and in 1994 her top students asked her to represent them. Since that time, Lilla Rogers Studio has become one of the most respected illustration agencies in the US, serving clients all over the world who count on her deep knowledge of trend. Being an illustrator and teacher gives Lilla the unique ability to help her artists grow, as she fully understands the creative process and how to nurture the best in each artist. 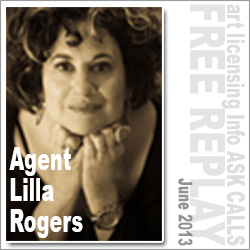 With so many questions coming from artists regarding working with an agent, Lilla tackles each questions and shares her answers . . . from the number of images in a good portfolio to potential earnings for new artists pursuing art licensing. Join our mailing list to receive the latest news and updates from Art Licensing Info.